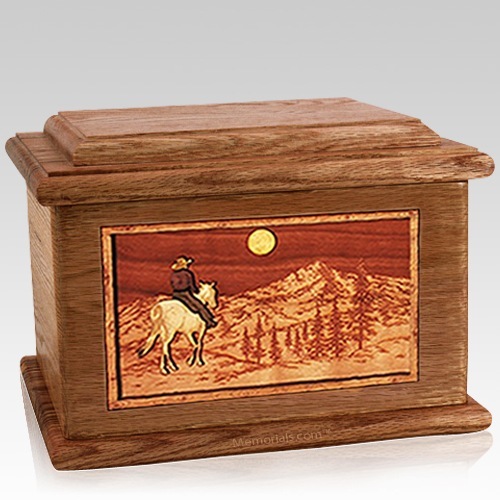 The Riding Home Walnut Memory Chest Cremation Urn is made from walnut wood and finely crafted pieces featuring a breathtaking, realistic nature scene, expertly carved into three dimensions using up to 7 kinds of wood. There is no paint on this urn. This will be a beautiful family heirloom for generations to come. It is master crafted in the United States by some of the most talented woodworkers in the nation. "I purchased three flag cases. I was looking for something well built and ascetically pleasing. It had to be American made. The Trooper Flag case suited my needs perfectly. The price of the cases were good. There was no sales tax and shipping was free. They also came with a free engraved plate. I was not able to find a better value anywhere. One of the cases was scratched when I received it. I called the number on the shipping label right away. I spoke to a women whose name I believe was Crystal. There was no hassle. She was friendly and professional. She explained to me how to make the exchange. Three days later I had the new case. I don't always get that kind of customer service. So tell Crystal she did a good job. Over all, my experience with memorials.com was excellent. The flag cases have honored my father, uncle and brother with the respect they deserve."